If we think about what blockchain is, we may find blockchain invent two tools for human. 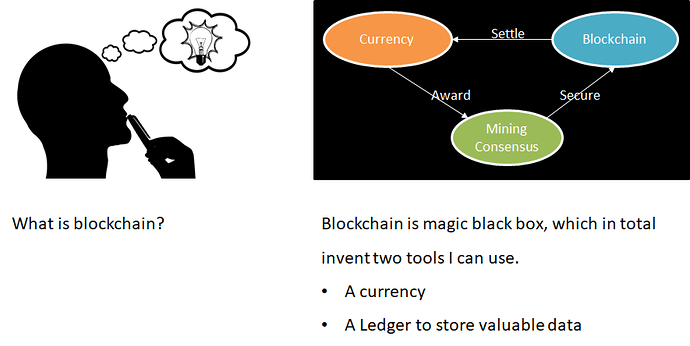 A currency and a ledger to store valuable data. Currency is more important. Firstly, bigger currency market cap results in safer ledger. This is the reason why Bitcoin and Ethereum are better ledger for valuable data. And secondly, currency has high frequency use-cases. Thanks to Satoshi Nakamoto, who invented Bitcoin 10 years ago, human open the gate of finance freedom. Cryptocurrency is a tool for billions of people to fight against dictatorship and unlimited inflation. Bitcoin can pay worldwide in 1 hour with better privacy. This help bitcoin wins payment in darknet use-cases. Limited supply makes bitcoin to be digital gold for value store. It is not enough. Bitcoin is too slow, and inconvenient. Ethereum invented smart contract to make ETH intelligent in ICO. And faster blockchain make ETH a better currency for value transfer. It is still far from enough. In most cases, crypto currency is not better than some fiats or gold. We need new features to solve real-world problems. This is the only way for blockchain technology and cryptocurrency enter mainstream. An expert team Aeternity has a plan to figure it out. Aeternity invent AE currency with built-in smart contract, state channel and oracle. Aeternity is also scalable by adopting bitcoin-NG, which is a POW consensus invented by a team in Cornell University. Come to learn about Aeternity, and build it together.